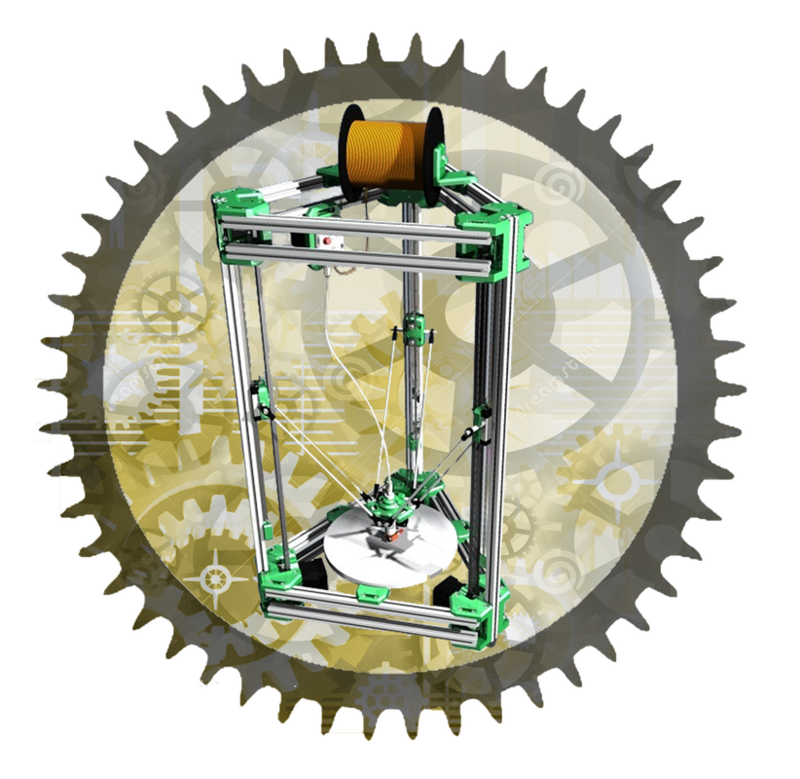 A small size 3D Printer, a kind of Rapid prototyping machines -RP, the work area is considered as a circle which its diameter is (20 cm) and the maximum value of height, which is represented by (Z) axis, is (160mm). According to the Kinematic Analysis, the three Cartesian Axes (X,Y,Z) are changed to three parallel axes ,as shown the pictures, by means of the Polar Representation method, in this method the (X,Y,Z) coordinates are replaced by two coordinates: the Radius starting from the center of the work table and the angle starting from zero degree according to the original circle, thus the angle is zero starting from the left and increases toward anticlockwise. The mechanism used in the parallel robots is also used in this machine; this mechanism is represented by the six joints, as shown in the pictures, in fact each two adjacent joints are one joint. The purpose of using two joints instead one joint is to prevent the rotation around any of the three axes known the Six Point theory, and so the actuator head remains with three degrees of freedom (DOF), these degrees of freedom are the motion toward the direction of (X,Y,Z) axes. By using this mechanism and Polar Representation, the three Cartesian axes are changed to three parallel axes; these three axes are located on the three angles of a equilateral triangle. To draw a specific slide at the height of zero; that means the actuator head is in touch with work table, it’s desired to certain every point included in the cross-section of the slide and represent it using the polar representation. The way to reach to every point is the movement of the sliding blocks related to joints which located on each axis, and that requires to determine the kinematic equations that ought to be applied to determine the point which we want to reach to at a certain height, the number of these equation is equal to the number of the axes. At the certain point which we want to reach to in terms of the radius and the angle for the polar representation we do a vector projection for all of the joints (in fact they are thee joints) on the work area with radius of (20cm), considering that the actuator head can be represented as a point, so the projection of joints will intersect in one point which is the actuator head located on the certain point, using Sin’s theory and Pythagoras theory with some additional factors resulted from the design dimensions considering the deviations because of the representing of the actuator head as appoint instead of triangle we can get the three kinematic equation express the distances that every sliding block should move to reach the certain point at the certain height.According to the Dynamic Analysis, the inertia forces and torques were studied, and so the maximum and minimum velocity required to move the actuator head. Consequently, stepper motors were chosen, the number of them is like the number of the axes, these motors rotate (0.9 degree) by each pulse they get, these motors characterized with a high accuracy, the value of rotation will surely taken in consideration to determine the printer accuracy, the load torque for each motor is (3.6 Kg.cm). According to the Design Issues, for the purpose of moving the sliding blocks, a motion method depending on synchronous pulleys and belts was used. This way characterized with a very high accuracy. In addition, linear guides ways were used. For the purpose of calibration, microphoto sensors were used, the number of them is three. According to the Actuator Head, it was provided with a protection system against the vertical shock with work table or the created slide on the table below the actuator head using a pressure spring, microphoto sensor and guides. According to the Printing Material, it’s a kind of thermoplastic which is melted at specific temperature. Usually, in 3D printer, two kinds of thermoplastic is used: (ABS, PLA). The PLA (Polylastic acid), this is kind is softer than the other kind and it has a melting temperature between (190 - 200 degree). This plastic can be melted using a ceramic heater located below the actuator head in the copper body which results to make the melted plastic flows from the head nozzle, the nozzle has a (0.5mm) hole. This king of thermoplastic is found like a thread coiled around a roller, the diameter of this thread is (1.75 or 3 mm), and the used diameter is the first one. The cooler made from aluminum is used to prevent the heat which comes from the ceramic heater to reach the upper points. The heat discharging can be done using a fan. The feeding with the plastic thread is done using a special mechanism which pulls the thread by means of a bearing and a roller to force the thread to go into the hose connected to the actuator.